Several years ago, the taller of the two dressers in my bedroom stopped being just a dresser. Oh, the drawers still held clothing as they were intended to do; but the top of the dresser became something else: a shrine. I had never planned on creating a shrine on my dresser, nor anywhere else in my home for that matter, and the transformation was gradual rather than abrupt. The Bible and the Book of Common Prayer replaced my jewelry box; a simulated ivory statue of the Madonna and Child, in the French Gothic style, and which I had purchased at the Cloisters, supplanted my comb and brush set. Around the holy pair I have draped a dainty rosary, given to me by a fellow passenger on the subway with whom I had struck up a conversation; and various books on spirituality took up residence between a pair of cherub-head bookends I had bought at a church gift shop sale. At the wedding reception of my best friend in high school’s daughter, I, as did all the guests, received a book of prayers, English on one side, Hebrew on the other. 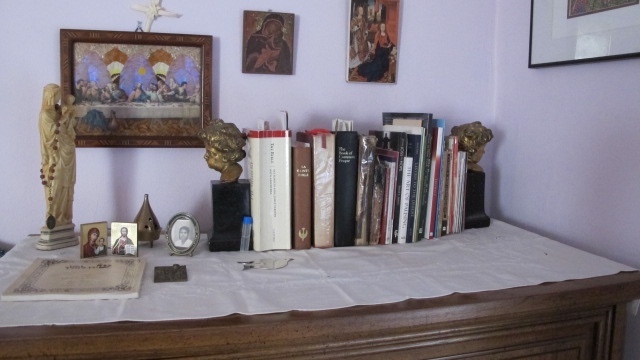 The book of prayers also has a place on the dresser top, a sacred souvenir of a joyful day. There is a photo of my mother — my beloved latter-day saint — in an oval frame. There’s a small vial containing holy water (so I was told) I brought back from a long-ago trip to Lourdes; and when the sunlight hits it just right, my small brass, exotic-looking incense burner from Holy Cross Monastery emits a soft, burnished glow. 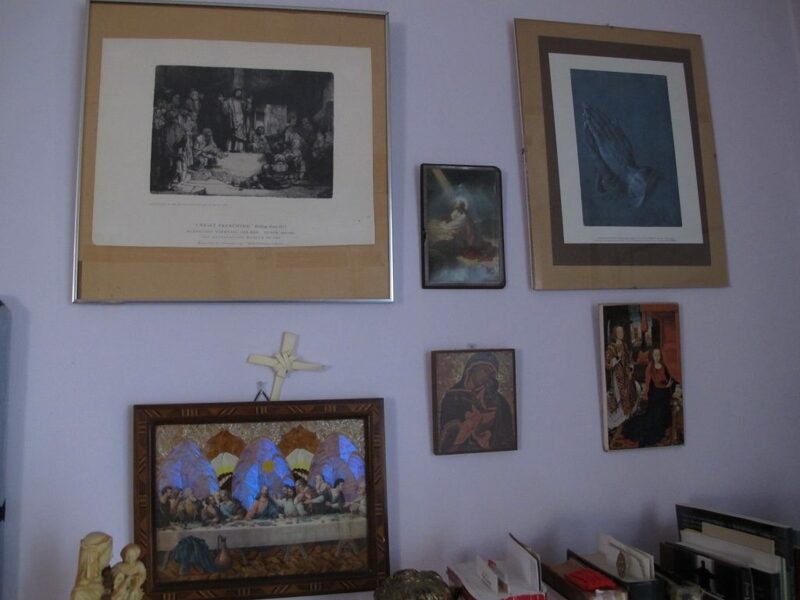 But long before my makeshift shrine came into being, I had graced the wall above the dresser with holy images, such as a slightly foxed copy of the Rembrandt lithograph Christ Preaching and Albrecht Dürer’s Praying Hands. The original works are displayed in the splendid galleries of great museums, where visitors stop to admire them solely as works of art. But for me, they are objects of devotion and contemplation that mysteriously transmit comfort and peace, and that inspire me to pray, such as my small icon of the Madonna and Child, whose serene and timeless faces exude compassion and divine love. As did many immigrants who came to this country, my (now deceased) Guyanese parents had brought with them cherished objects from their homeland. 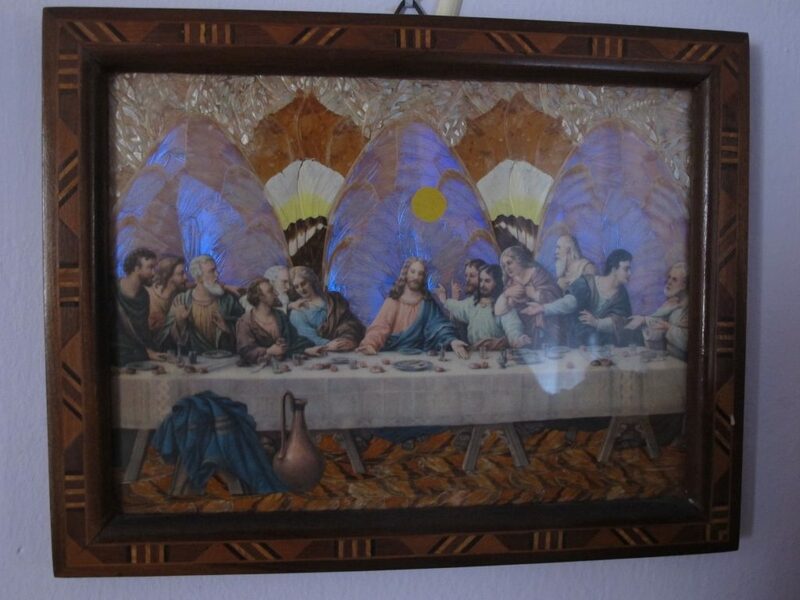 Among these was the image of the Last Supper, where an anonymous Guyanese folk artist had set a cutout image of Leonardo da Vinci’s familiar group of Christ and the disciples at table against a stunning background of wings from butterflies native to Guyana. All of this is within a beautiful frame of inlay wood, it, too, native to that country. The picture, which had hung in my childhood bedroom, was the first and last thing I set my eyes upon each day, and has now joined those other aforementioned sacred images that adorn the wall over my dresser shrine. Each Palm Sunday, I tuck a small cross I have fashioned from a palm frond between the frame and the wall. It is not possible for me to make a pilgrimage to one of the great, historical shrines, but I can go at will to my humble homemade version. My little Amen Corner is a place apart, a sacralized space where I enter into silence and prayer, the private place where I go to God in secret, as Christ told us it is best to go. Although part of the larger shrine, each object I have acquired and added to it has a special meaning unto itself, and all form a portrait of my spiritual journey. They are the markers of where I have walked and of what I have learned along the way. I often touch or hold these dear objects, taking in their inner life to strengthen my own, and, like any souvenir, they summon deep memories of people, places, and events. Having a shrine has helped me to appreciate the meaning and importance of sacred sites. 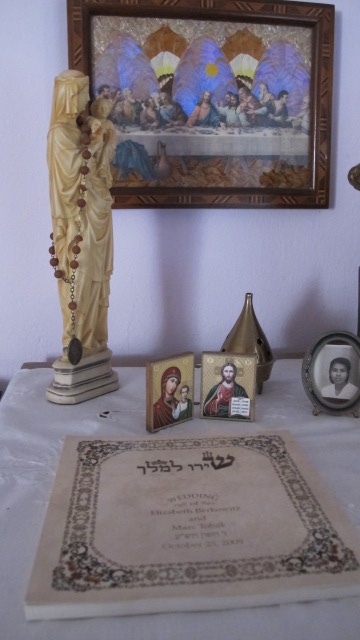 In an increasingly secularized culture, home shrines are the equivalent of our national parks, protected spaces where people can commune with nature that is untouched and unaltered by the human presence. In like manner, I see my shrine as a holy zone and place of refuge where I bring my concerns, problems, and hopes and hold them up in prayer before God. It is a place of reflection, celebration, and serenity. If you have an “amen corner,” did it develop gradually, or all at once?